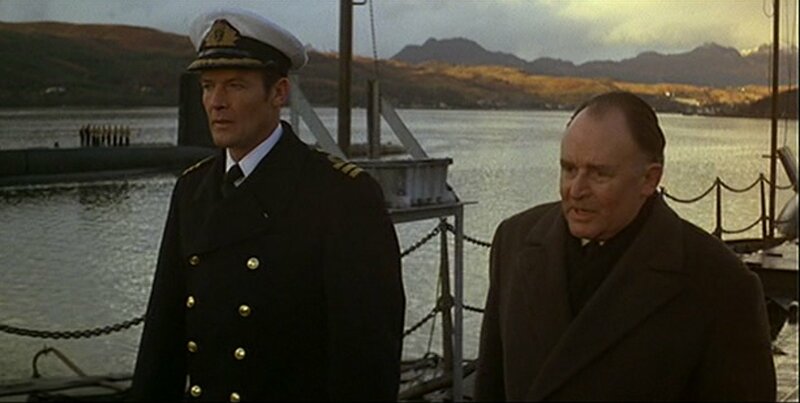 In The Spy Who Loved Me, Bond wears a naval greatcoat over his naval uniform. The full-length greatcoat has a double-breasted front that buttons to the top with twelve shanked metal buttons, and Bond leaves the top buttons open. Shoulder straps hold Bond’s Commander rank insignia. The deep navy coat is most likely made of wool melton. It’s a heavy coat that keeps out the wind on the seas and keeps warm everywhere. 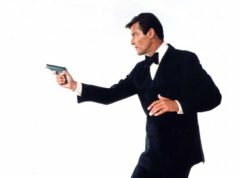 Bond also wears a Royal Navy peaked cap with a white cover, a back band and a black peak with a row of oak leaves. The naval uniform Bond wears underneath can be seen here. Commander should be capitalized, as it is a Royal Navy Rank. Sadly these excellent coats are rarely spotted these days as a nylon raincoat seems to have taken over as the RN outerwear standard. 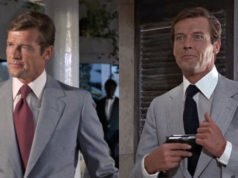 I like it when Bond wears his uniform, I think it’s a great way to connect the character of the screen with his literary heritage. How is the back of the coat ? Pleated ? Belted ? Or is it not shown ? Anyway, these greatcoats are beautiful. I am a civilian but would wear a greatcoat with pleasure if only I could find one in RTW. We don’t see the back but it probably has a belt that is fastened to the coat with a brass button on either side. They often have a pleat and vent in the middle of the back. I had a gorgeous RAF officer’s greatcoat. It was tailor-made (not for me!) using an EXTREMELY heavy-weight Crombie cloth. It was beautifully-made, with wonderful details, and I would certainly have worn it, but in the end I sold it because it was slightly too large for me. These days sadly an RN officer would only wear a greatcoat with 1A or 1B Formal Dress (for ceremonials and state events), and then it would only be “Drawn from Loan Stores” temporarily. However, the military tailors at Gieves & Hawkes (1 Savile Row) will provide the authentic 1940’s pattern full-length coat in waterproofed melton cloth with sword slit, storm collar, and boards attached, for 2,500UKP. Royal Navy officers’ greatcoats are often to be found on eBay (along with other naval uniform items). My greatcoat is doeskin (30 oz cloth) and is beautifully warm. Many serving officers have their own greatcoats obtained from a number of sources. Greatcoats are still worn in the French Navy for winter ceremonies, although rumour has it that they are to be phased out in the years to come. They are very similar to the RN greatcoat except for a few details : eight buttons instead of twelve (they cannot be buttoned to the top), the rank insignia are worn on the sleeves and the cloth is a much lighter navy blue (“bleu Louise”). The pattern of the French Navy greatcoat dates back to 1931 if I remember well, which makes it almost a century old ! As a commander in the French Navy reserve, I have my own greatcoat and I must say it is a real pleasure to be able to wear it.